The Mezzo first made a public appearance at the Islington Cycle Show late in 2004. 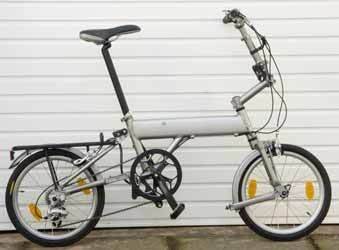 Several bikes from a pre-production batch were shown at that time, and it created considerable interest, appearing practical, sturdy, attractive and compact when folded - almost as compact as a Brompton. It seemed to be aimed at the Brompton sector of the folder market - a compact commuting folder, and potentially serious competition for Brompton. Two versions were planned - the i4, fitted with a Shimano 4-speed hub gear, and the d9, with a 9-speed derailleur gear. The designer of the Mezzo is Jon Whyte, whose name is well-known in mountain bike circles, and the bike was being marketed by ATB Sales, a well-established company who also handle the Whyte amountain bikes, amongst other brands. It was some months before the i4 models reached the shops, and it's been suggested that these initial bikes were part of a quite small batch made and sold to get owner reaction prior to larger numbers being made. Despite the relatively low key launch process, quite a number of major cycle shops are now selling the Mezzo. I'd been keen to test the Mezzo, but with limited inital supplies, the i4 never came to me - A to B tested it though, and you can read their impressions in issue 47 of A to B. The d9, which sounded more my type of bike, has taken longer to get into production, but it is now available, and ATB Sales let me have one to test in August. Unfortunately this coincided with a bad cold, immediately followed by a nasty tummy bug, so it has taken longer to produce this report than I expected. Producing a report on this bike has been quite difficult. Folder design always involves compromise, and this means that a bike which makes a good commuting (train assisted), compact folder is usually not at its best on long fast runs on the road, and vice versa. The Mezzo is clearly designed with compact folding in mind, while naturally seeking to make the bike as good as possible in all other respects as well. As a bike which puts compact folding as a priority, this clearly puts it in competition with a Brompton, which is generally seen as the leader in this market sector, and prices are very similar as well. A large proportion (though certainly not all) of other compact folders really compare so poorly with a Brompton that they really don't merit being assessed directly with it, but the Mezzo is a well thought out machine, and this means that it does rate close comparisons with a Brompton - which is a hard act to beat - and in view of its many excellent features, it's easy to subject it to a much more severe assessment than many other folders get. Please bear this in mind in reading some of what follows. In the report frequent comparisons will be made with the Brompton, simply because they seem aimed at the same market sector, and until now most people have regarded the Brompton as setting the standard by which other folders will be measured. I'll be discussing most aspects of the bike later in the full test, so here I'll just list the main features without comment. Gears: d9 - 9-speed derailleur, 12-27 tooth cassette and 52 tooth chainring (original spec was for 48), giving gears of about 32-71 inches. Capreo rear mechanism and handlebar changer, the latter having a Rapidfire-type lever for changing down (1 or 2 gears at a time), and a push button for changing up. i4: 4-speed Shimano internal hub gear with 18 tooth rear sprocket and 42 tooth chainring, giving gears of 37.5, 46.5, 56.2 and 69 inches. 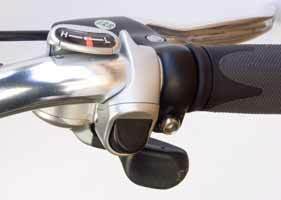 Twist grip changer on the handlebars. Brakes: 'Promax' dual calliper front and rear. Pedals: Folding (both), marked 'Stomp', both fitted with reflectors, but no means of fitting toeclips (like almost all folding pedals). Other fittings: Front and rear mudguards (front is an integral part of the folding system), rear carrier, bell, two amber reflectors in each wheel, white front and red rear reflector. No pump or mountings, no bottle bosses. Colour/fiinish: Originally silver gloss or anodised - see note below. Price (as listed by typical dealer in October 2005): i4 gloss, £595; i4 anodised, £625; d9 gloss, £625; d9 anodised, £645. November update: The gloss finished models are no longer available - all Mezzos now have the anodised finish. I have not tested an i4 model, so these comments are based on the specification, with particular reference to the gearing, as that is the only difference between it and the d9 which I tested. 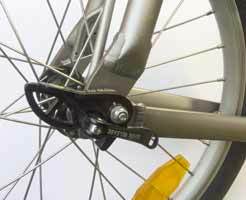 The i4 uses the standard Shimano 4-speed hub, which has been around for some years. The nominal gears are 37.5, 46.5, 56.2 and 69 inches - rather low at the top end, but not bad at the bottom end given the overall range. If you live in a flat area, and/or are a strong rider, a larger chainring (42 standard) or smaller rear sprocket (18 standard) would raise all the gears. The overall range, 184%, is not a lot greater than for a Sturmey-Archer 3-speed (177%), but every little helps, and the extra gear gives a much more even progression of gears, with much more acceptable gaps between the gears. My only experience with the Shimano 4-speed hub was on the Airframe, and on that I liked the gear spacing and the slight gain in range over the 3-speed S-A. On the Airframe the twist grip changer was quite positive and easy to use, and in terms of gearing and performance I found it much more to my taste than the Sturmey (and other) 3-speeds. The one thing I did not like was that adjustment of the cable was done entirely with the adjuster on the handebar twist grip, with limited adjustment range, and any other adjustment would have to be done by releasing the pinch bolt securing the cable at the back of the bike, which would be extremely awkward to get right when first fitting a new cable. On top of this, I found the way that the cable clamping unit fits onto the hub, which must be released when removing the wheel to deal with a puncture, was horrible - very awkward to work out how to route it, especially if you don't do it on a regular basis. This is an issue with a number of hub gears now - the new Sturmey 8-speed looks to have adopted a simlar, awkward, method of fitting. Actually the test bike was delivered by hand, so I did not need to take it out of the box, so the heading only indicates that this section does not relate to riding the bike. First I'll look at the basic features of the bike, with some general comments, though most of the discussion will come in the road test section. The points of contact between the rider and the bike, and the bike and the road, can play a major part in the performance of the machine, but on the other hand they are also things that are usually relatively easy to change if you don't like them. The folding pedals seem fairly robust items - both sides fold (not really necessary for the right-hand one, as it does not project when the bike is folded), and seem to run freely. 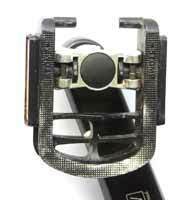 However, there is no provision for fitting toeclips or straps - a common problem with folding pedals. For town riding this is no real hardship, but I certainly prefer to have my feet anchored rather more positively on the pedals in other situations. 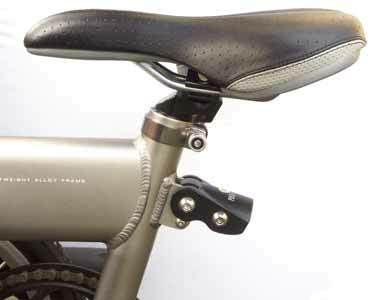 The saddle is mounted on a micro-adjust seat pillar, and is a reasonable version for standard fitting. Unlike some bikes, I felt no need to change it during the test, though it was slightly soft by my standards, and it is possibly a bit narrow for ladies. As is usual nowadays, there are no saddlebag mounting loops. As supplied, the microadjust seat pillar is mounted in the opposite direction to the usual, which pushes the saddle nearer the bars, giving a distinctly upright riding position. This is done to make the folded bike smaller, but I turned it round to the more normal position, and moved the saddle back as far as it would go, which gave me a very satisfactory riding position in terms of reach (but I am a fraction under 5 ft 7 inches, so very short). The seat post is marked at 1cm intervals, which makes adjustment to suit different riders, or to get the saddle at the right height after unfolding, easier. However, taller riders (not exceptionally tall though), wanted more seat post height than was available, assuming that the recommended maximum height was designated by the last marking on the seat post (There was no very obvious specific marking to show maximum safe height - after reading this report ATB Sales pointed out that there are some markings on the seat post another 4cm or so lower which are meant to indicate maximum height, so the saddle can be raised rather higher than we realised during the test period. 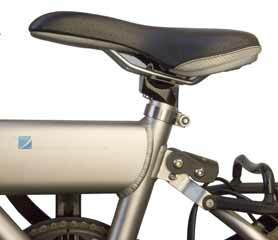 This certainly gives more height adjustment than is possible with the Brompton using the latter's stand seat post). As far as I am aware, there is not currently a longer, or telescopic, seat post available. Even the shortest adult riders should have no problems with the seat at lower position. 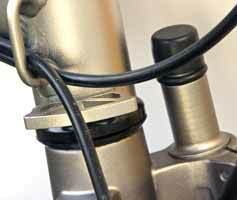 The seat post clamp is an unusual design, which I'm told by ATB Sales is much more effective than the mormal designs. Certainly there were no problems with the post slippiung down during riding, as is unfortunately the case with quite a lot of other machines (not just foloders). 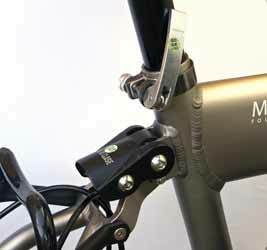 The handlebars are adjustable for height, but this requires the use of an allen key. At the minimum height position they were still a bit higher than I would like ideally, and tall riders with a particularly upright riding style might want more height. Riser bars are fitted - changing these to flat bars would suit me better. Another reason why I would prefer flat bars is the ugly way the changer projects over the bend - on the test bike it was not initially possible to adjust the gears with the small knob on the changer as this was in contact with the bars, requiring slight rotation of the brake lever and changer to give clearance. The bars were a bit wide for my taste - especially for town use - and the riser pattern means you can't saw a bit off the ends either. The grips fitted seemed to have a softish surface (very positive for grip) but without much give - a good combination. The tyres are labelled Chen Shing - not usually a very good sign - and are labelled as 45-55psi, again usually a bad sign. There is a shallow tread on the tyres, a pattern which seems fairly appropriate for a bike of this kind. I'll come back to the subject of tyres when we get to the performance on the road, but suffice it to say that they lived up to my worst fears. Dual pivot brakes are fitted front and rear, which are just about at the limit of their downward height adjustment to clear the mudguards. The levers are quite nicely made, much better than the horrible ones used by Brompton, though with no adjusters on the levers themselves - the adjusters are on the callipers. The callipers feature a lever to allow them to be moved outwards, to make wheel removal easier with the tyre on and at least partially inflated. The cable run to the rear is moderately long, and involves rather a bend at the brake end. The cable outer is in two parts, with a short exposed section of cable under the main frame. Very solid loops are provided on the frame through which the cable is routed, and it threads through the fork members at the back to keep the cable under control when the bike is folded. The 12-27 range seems, on the face of it, surprisingly narrow for a 9-speed system, and the use of a minimum of 12 teeth also is unusual - on small wheelers 11 is more common, and the Capreo component set which Shimano produce for small wheelers actually goes down to 9 teeth, raising the gearing to compensate for small wheels. It's a bit unusual to find that the Mezzo uses a Capreo changer on the bars, and a Capreo rear mechanism, but not the small cogs of the Capreo cluster at the back. ATB Sales explain that they have not used a Capreo cluster as the choices are much more limited than with the conventional cluster (only 9-26 or 9-28 with Capreo), and availability of spares, now and in the future, would be more of a problem if Capreo were used (I should add that the Capreo requires a different hub, so that if it were used, a more common cluster could not be fitted to a Capreo hub). I'll come back to gearing later, in the road test section. The shape of the tiller steering arrangement makes the fitting of a front bag a la Brompton impossible, though I suppose a front bar bag could be used (something I don't like myself, as it always has an adverse effect on the steering). 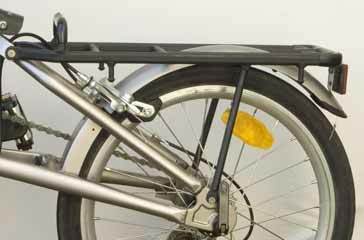 The substantial rack at the back also acts as a stand for the bike when folded, or using a first-stage fold for parking. Of course this means that any luggage mounted on the rear rack has to be removed first when parking in this way, or when folding. Incidentally, you cannot practically take the rear rack off (though simple bolt mounting is used) as the bike would not stand up when folded without the rack, and additionally the rear part of the rear mudguard is anchored via the reflector to the rack, so the mudguard would have to be removed as well. There is no quick release luggage available at present, though there are a couple of interesting bosses on the carrier, and I understand that ATB Sales are looking into addressing this issue. I tried the Carradice rear box bag, rather narrow and upright, which is sold for folders, and this mounted nicely on the rack, though the Velcro straps are fiddly for attaching and detaching it, and I doubt that they would stand up to the extensive use they would get. Instead, most of the time I used a Rixen Kaul bag and quick release mounting. This is rather small, but light, and the mounting is not all that robust, but it is lighter than Carradice's SQR system, and it does not prevent the seat post being lowered as much as the Carradice system. Folding of the Mezzo is fairly straightforward. There is no hinge in the main frame (ATB stress that this is an important point in ensuring frame stiffness), so the process is probably most similar to that of the Birdy. Stand on the right hand side of the bike, turn the handlebars as far anticlockwise as they will go (against a stop), and holding the bars in this position, release the catch on the rear triangle, and fold the rear triangle underneath – the bike will then stand up on the rear carrier, like a Brompton. Tilt the bike away from you, then release the quick release on the front wheel and the front wheel catch, which hold the wheel, mounted via the mudguard stays, into the forks. 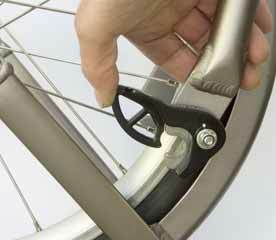 Swing the front wheel down, and push the mudguard stay in to engage on a plastic catch. 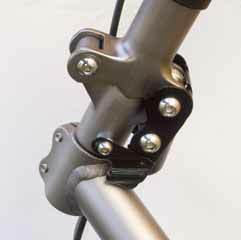 Finally, release the locking catch on the handlebar stem, and fold the bars down – there is no catch to hold the folded bars in place, but none is needed, as the action is slightly stiff, and they are held in place be friction. Finally drop the saddle, which locks the rear triangle in place (like a Brompton). The most awkward part is releasing the front wheel and clipping it into the plastic mount, though it’s not really difficult. I also found on once occasion that dirt which had been thrown up while riding into the bottom of the seat tube made it extremely difficult to lower the seat post – in fact in the end I had to remove the post and wash out the tube before I could lower the post. I have had this problem with other folders (eg my Dahons, though ATB Sales were incredulous that I had experienced the problem with the Mezzo, as the design of the seat post clamp and clearances between the post and tube should apparently make this impossible). The catch holding the rear triangle in place is very robust, and very easy to release – it is no disadvantage when folding the bike, and a big advantage when lifting the bike in the unfolded state compared to a Brompton. The end stop which limits the rotation of the bars when folding also limits movement when rotating them clockwise, so that you can’t try to rotate them the wrong way when folding. It doesn’t limit steering lock for normal riding (Dave Minter even managed to do a track-stand on the bike without it being a problem), but it might slightly restrict manoevering when putting the unfolded bike on and off a train, or moving it around indoors, or through obstacles on a cycle path. In any of these cases, lifting the rear or front end easily overcomes any problems in this respect. The folded bike is very neat, and, like a Brompton, you would probably normally be able to transport it on a train without needing to cover or bag it. It’s a little larger than a folded Brompton, but still very compact. 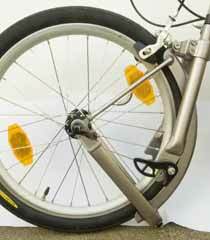 With no auxiliary wheels, once the bike is folded you have to carry it – no option of wheeling it on auxiliary wheels (there aren’t any), nor on the main wheels. On the other hand, it balances quite nicely when carrying it – I found it easier to carry than a Brompton for this reason, though the weight is much the same. I managed to get off a train at platform 1 in Birmingham New Street and carry the bike all the way to the top of platform 12 before stopping for a rest – I certainly can’t do that with the Brompton. I'm told that as of November 2005 auxilliary wheels are now fitted on the carrier, and these can be retro-fitted to bikes sold before that date. For parking, you can simply release the rear triangle catch and fold the triangle under, so that the bike is parked just like a Brompton. However, if you are going to proceed to a fold afterwards, you need first to turn the bars fully anti-clockwise – if you don’t do this, then before folding you would first need to flip the rear triangle out, and restart the folding process. A simple first stage parking fold. If you intend to go beyond this to a full fold, then you should turn the handlebars as far anti-clockwise as possible first, before folding the rear wheel under - if you start with this simple parking operation, you will need to unfold the back again in order to turn the bars round for the full fold. Overall the folding process is quite easy, though the need to drop the front wheel assembly and clip it in the plastic mount (see picture) is to my mind slightly less convenient than folding a Brompton, though no more awkward than folding a Birdy. Unfolding is simply the reverse process, and should be fairly straightforward. In practice I found it much more awkward, due to problems associated with flipping the front wheel out of the plastic clip, and then engaging the catch to hold it in the main forks. I was never able to get the catch to engage without a great deal of fiddling, at least partly due to the fact that the nut end of the quick release skewer caught on the fork cut out, and required positioning to enable the catch to engage. On more than one occasion it took well over a minute to achieve this. 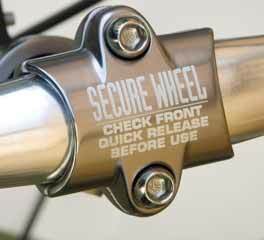 Above: 3 views of the latching system which secures the front wheel/stays into the main forks. Below: A view from the other side, showing the nut of the quick release, which on the test bike tended to catch on the fork slot, making it awkward to swing the wheel back into place when unfolding. 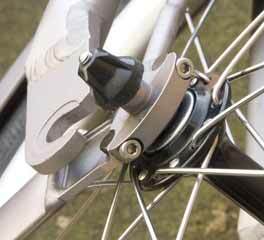 Note also the way that the wheel is fixed into the pivoting mmudguard stays assembly - two allen bolts, which must be released to get the wheel out, eg when replacing a tube (referred to later). There is a warning on the handlebars about the need to engage this catch properly, and then lock the quick release skewer to hold everything. I was worried that if for any reason the catch were not engaged properly, it would be possible for the wheel to hinge out while riding (the forces act to release the wheel, not hold it in place). Despite being aware of this possibility, after one particularly awkward session trying to pivot the wheel back and engage the catch, then lock the quick release skewer, as I started off, after, as I thought finally succeeding, the wheel swung out, and the bike nose dived. If the catch is fully engaged, there should be no problem, and the quick release skewer should be the braces of a belt and braces arrangement. However, due to the difficulty of lining it up on the test bike, and the fact that the catch and quick release partly obscure the visibility of the latching mechanism, I inadvertently proved that it is possible to get this wrong. 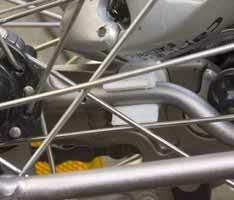 If the wheel swung out while the bike was being ridden, due to incorrect engagement of the latch, there could be a very serious accident, as the forces are all acting to cause the wheel to hinge out, rather than to hold it in place. The latch holding the handlebars is a substantial item which locked very positively. A thin piece of springy metal pushes into a groove to discourage the catch from opening, but the effect is not very great. The problems in hinging the front wheel back into place, and locking the essential catch, detract from the folding, at least on the test bike, and as I have indicated, I do have some safety concerns – it is absolutely essential to make sure that the catch holding the wheel in place is fully, positively engaged, and this was not easy on the test bike. There is another point to be made regarding the way the wheel hinges using the very robust mudguard stays and mudguard. 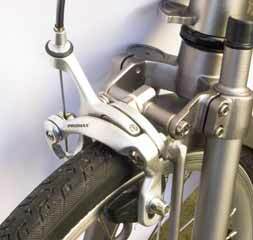 The quick release skewer serves to hold the wheel in place when it is engaged, but when the bike is folded, the wheel has to be held in place in the mudguard/stays assembly, and this is done by a clamp (see earlier picture). So to take the front wheel out to repair a puncture, change a tyre etc, you have to remove two small allen bolts and lift the clamp off, making sure that the loose circular-section nuts do not fall out and get lost in the process. Once the clamp is removed, you need to spring the stays apart and fiddle to persuade the wheel to come out. Replacing the wheel is even more awkward, as the circular section of the nuts into which the clamp bolts fit have to be rotated so that the threaded hole is in the right position. I’d hate to have to try to do this in the dark, in the wet, by the roadside! No allen key to fit the clamp retaining bolts is supplied with the bike. Above: The Mezzo folded (centre), with a Brompton (actually an SP version) on the left and a Dahon Jestream P8 on the right for comparison. Only the Brompton would stand up on its own on the soft lawn surface - the Mezzo stands on its rear carrier, but the small stud on the mudgaurd (shown below) is what stops it overbalancing, and on soft ground this just sank in, and the bike toppled over. When the front wheel self-folded (see earlier), the stud came off the mudgaurd, and I was never able to fix it properly after this. Over the period that I had the bike, I did a number of rides of various lengths (no long ones though) and on various road surfaces, and canal towpaths. There were some, rail-assisted commuting journeys, shopping trips and leisure rides. The bike was also taken to a number of group rides (train-assisted journeys to and from the event), and several other people tried the bike as well. All of those who tried the bike can be regarded as experienced cyclists, and cycle enthusiasts, but they varied quite a lot in terms of strength, riding style and the sorts of distance that they usually ride. In commenting on the performance of the Mezzo on the road I will be taking account not only of my impressions, but those of the others who tried it, and in all cases I’ll attempt to relate to what potential owners in general will be interested in, rather than any purely personal preferences. Nearly all those who rode the Mezzo commented very favourably on its ride and handling – there is much less sense of it being over–responsive (or twitchy!) as there is with most small wheelers when you first ride them. Dave Minter demonstrated this stability by riding it no-hands, not something he would normally try with a bike with 16 inch wheels, and of course not good practice other than as a test of the handling. Two Brompton owners felt it was less stable than their usual mounts, but they were very much in the minority (and all the other people who used it have experience of Bromptons). My initial impression, and one which I did not change with more use, was that the performance was sluggish, with a distinct impression of high rolling resistance from the tyres. These are branded Chen Shing, and are rated on the sidewall as only 45-55psi. Generally, low pressure tyres have higher rolling resistance (there are some modern exceptions, usually very fat tyres, but it’s a pretty good indicator). A rolling resistance test using a hill which I have often used for such purposes gave a very poor result, so I tried putting a pair of Primo Comet tyres on instead – these are one of the free-est rolling tyres available. These definitely improved matters, though somehow the bike still did not feel particularly free-running, which mystifies me. If I owned a Mezzo, I would certainly upgrade to better tyres as soon as possible. Although I had no punctures on the bike during the test, I did need to change the tyres front and rear twice – once to fit the Primos, and again to refit the originals. Unusually, it is the front tyre which is the more difficult to deal with. As mentioned earlier, because of the way that the front wheel folds under, the axle is secured by a bracket with two allen bolts which have to be removed to get the wheel out. The bolts engage two threaded circular section nuts. 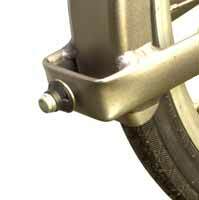 You need an allen key to do the job, and the nuts are liable to escape when the wheel is removed. Refitting is more tricky, as the nuts need to be rotated so that the bolts engage the thread. The tyres were an extremely tight fit on the rims – both makes of tyre, and both wheels. As supplied, the saddle is relatively close to the handlebars (at least for me, and I am very short). However, you can turn the seat post around by 180 degrees and remount the saddle to give a longer reach (see earlier picture) – this makes the bike slightly larger when folded, but certainly more comfortable for me (the Brompton has a removeable forward projecting bracket which keeps it more compact when folded, but in the same way most people find they need to remove it to get a comfortable riding position). By moving the saddle as far back as possible in this revised seat post location, I achieved a very comfortable riding position – obviously a personal matter, but I’d rate it as good in terms of adjustment provided compared with many compact folders. The seat post is calibrated to indicate height (why don't all folder manufacturers do this? ), so it is not too difficult to put it back in the required position after lowering it to fold, or when several different riders are using the bike. However, taller rides (some not much over average height, though with long legs) found they could not raise the saddle high enough (NB none of us were aware at the time of the test of a, not very visible, maximum height marking which is some 4cm away from the calibrations, and allows the saddle to be raised safely to a greater height.) . As far as I know, there is not a present any option of a longer seat post or a telescopic one. The saddle supplied on the bike was perfectly acceptable for the rides I did on it. The handlebar height is adjustable (an allen key is needed for this), but even at the lowest position it was still just a shade higher than I would ideally like (as mentioned before, I’m very short). There isn’t a huge amount of height adjustment, but most people should be happy with it, and it is certainly in the Mezzo's favour that some adjustment is provided, unlike many other folders, including the Brompton). The handlebar assembly is mounted in a rather tiller-like way – possibly the appearance of this is what made a couple of riders comment on stability, though everyone else found stability excellent. Despite the rather long distance from the pivot, the handlebar assembly did not bend significantly when pulling on the bars on a hill – I’d rate it is good in this respect, especially compared to some compact folders. As the frame does not have any hinge, the Mezzo feels very rigid as a whole. The design of the handlebar stem does, however, mean that there is no way that you could mount front luggage on the frame in the way that the Brompton does. I did not try a handlebar bag- generally I find these unsatisfactory in terms of their effect on the handling, though in terms of convenience of access they are good. This really means you have to put luggage on the rear carrier (or use a saddlebag or similar). Putting anything on the rear carrier means having to dismount it in order to fold the bike, which adds substantially to the folding/unfolding time. I used a small R-K bag mounted on a quick release mounting during the test, and this worked well, though limiting slightly the amount by which the seatpost can be lowered when the bike is folded. The folding pedals were fairly easy to fold and unfold – just push them in to disengage the catch. They felt fine in riding, and gave a good grip, though the inability to fit toeclips and straps is a drawback for more enthusiastic riders (one shared with just about all folding pedals). The bike is fitted with riser bars. Replacing these with flat ones would allow the bar height to be reduced a bit more, which is personally what I would do. There are other reasons why I’d prefer the flat bars - the mounting of the gear change and the ability to cut the bars down to a narrower width, as discussed earlier in the report. I usually fit bar ends on my bikes which have flat bars – I didn’t do this on the test bike as it would have meant damaging the grips, and with the riser bars space was restricted, but for the short/medium distances I rode it I was quite comfortable without the extensions, though on a longer ride I would have liked them, to allow a choice of riding position. The bike has a Capreo changer mounted on the bars, one which uses a lower lever to change down (like ‘Rapidfire’ changers) – a normal push on the lever changes down 1 gear, a longer push changes down 2 gears, but no third position as on some Rapidfires (see ealier picture). To change up you press a button on the top of the changer. 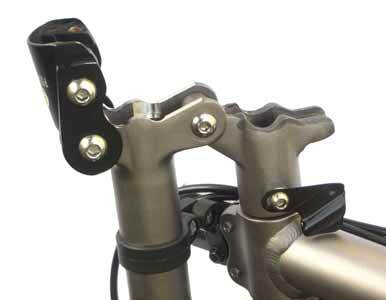 A cable adjuster on the lever assembly allows for fine tuning when setting the system up – on the test bike the lever was mounted so that this adjuster could not be rotated, as it caught on the curve of the riser bars, and a small alteration to the postion of the brake lever and changer was needed to fix this. The operation of the button and lever was fine. It is matched at the back with a Capreo rear mechanism, but, in view of the good quality of these Shimano components is good, I can only rate the quality of gear changing as distinctly disappointing. Changes felt and sounded agricultural, and were not very precise, despite spending quite some time trying to adjust them to produce better results. That said, the change was acceptable – just not as good as I had expected. In riding, I found the gear range felt rather limited, bearing in mind that this is a 9-speed cassette. Given the choice of a 12-27 cassette, of course it IS relatively limited. I generally prefer to be rather under-geared, but on this bike with this cassette, the top gear is only just over 71 inches, and this really was low even by my standards. A 31 inch bottom gear would normally be fine for me on a bike like this (in fact in theory I would have raised the gears overall by about 10% to give a more acceptable top gear), but, perhaps because of the rather sluggish tyres, even that did not feel especially generous, and I found myself using the lower two gears much more than I would have expected. The close spacing of the gears also meant that most times I needed to change up or down, I would change twice. ATB Sales are emphatic that they have chosen the gearing to suit the general user in the intended market. However, the more common view is that lots of closely spaced gears with a relatively narrow range are what racing cyclists prefer, and tourists and commuters prefer wider spacing and a wider range. I hate bikes that are too high geared and with over-wide spacing between the gears (a reason I find the 3-speed hub gear system does not suit me at all), but I certainly felt that on the Mezzo they have gone to the opposite extreme. All the wide variety of other people who tried the bike also felt the gearing was inappropriate. As I mentioned earlier, ATB Sales are emphatic about the desirability of what they have fitted, and point out that if the owner wishes, an alternative cassette set could be fitted – for example, an 11-32 system would slightly raise top gear, give in effect an additional gear at the bottom, and would give a spacing to suit those who do not like very close spacing. 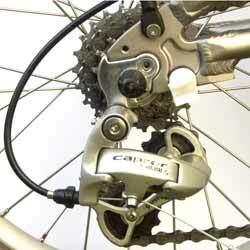 They also point out that they did not do what might have seemed the obvious, namely to fit a Capreo cassette (9-26 or 28), as this would have required a Capreo hub, in turn meaning that the range of alternative clusters and spares would be very limited – a fair point. The Capreo rear mech, with a short-arm cage, which has the advantage of giving reasonable ground clearance - always a problem with derailleurs and small wheels. The brakes are dual-pivot cantilevers front and rear, with good quality levers on the bars – much nicer to use than those fitted on some folders! Unfortunately I found that they did not stop the bike at all well – the rear brake seeming particularly ineffective. I tried replacing the brake blocks with Aztec ones (usually considered particularly good blocks), and very thoroughly cleaning the rims. This did not help a lot, and I’d still rate the brakes as rather poor after doing this. There is no obvious reason for this – the rear cable run is not particularly awkward by folder standards, and did not seem to be creating losses. I rather suspected the apparent surface finish of the rims, which is very shiny, and which also does not seem to wear as much as one might expect on the brake contact surface. As I mentioned at the start of this article, I have found this a difficult report to write, which is partly why it has taken much longer than usual. The Mezzo is an extremely interesting folder. It looks, and is, very robust and well made. It folds into a compact package. I had some concerns about the unfolding process and the latching of the front wheel in place, and even managed to have a near disaster with this arrangement, despite having observed during my initial examination of the bike that this was a critcal area, and warnings to this effect are prominently displayed on the bike. Luggage handling is certainly much less convenient than the excellent front bag system of the Brompton (which is superior to just about any folder in this respect) – a bag on the rear rack has to be taken off and re-attached when folding and unfolding, and a quick-release seatpost mounting bag may be the best solution, unless or until a quick release rear rack bag is available. I found the riding position and stability to be very good indeed, and the majority of other testers thought the same. The bike was also admirably stiff, with no sign of any flexing in normal use - this was apparently a major factor in the design, and a reason for not using a hinged main frame member. On the road, I found the original tyres to give a very sluggish ride, and the bike deserves better. The gearing was also not to my taste, and nor do I think that it is appropriate to the majority of people who might buy the bike. All the other people I invited to try the bike expressed the same view – without prompting by myself. ATB Sales do not agree, so we can only agree to differ on this point. I also considered the braking performance to be rather poor, at least on the test bike. The Mezzo has very many good points, and perhaps these raise excessively high expectations, so that those areas in which it does not shine become over-emphasised. I personally felt that it did not live up to all my high expectations, and I did not feel inclined to use it, even on a test basis, for any rides over 40Km. However, I have heard from one owner who has done John O Groats to Lands End on one of these bikes, doing about 100 miles a day! Even given that he is a club rider, had vehicle support, and did it as a challenge, it still shows that this can be a very capable machine. 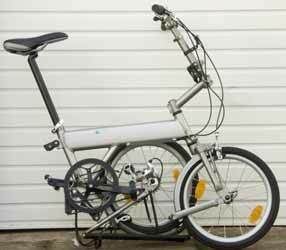 The price of the Mezzo is fairly similar to that of a Brompton (not the super light versions, which are more expensive! ), so it is not especially cheap, but reasonable given the quality of manufacture etc. Right of reply: I made this report available to ATB Sales, who handle the Mezzo, after it was originally written in October 2005. I've modified the details in a few respects as a result of their corrections - thanks for the input. They particularly pointed out that the word 'Brompton' had been used far more than 'Mezzo". I can only say that I could have put far more references to 'Mezzo' in the report, but it did not seem necessary in the context of the fact that this is a report ON the Mezzo. As stated at the start of the report, and in the conclusions, the Mezzo has many good features, and is superior to most of the folders which seem to be aimed at the same market. It has some advantages over the Brompton, but does not clearly surpass the Brompton. Of course, the Brompton has been around in pretty much the same form for over 15 years, and has been developed to improve weaknesses, whereas the Mezzo is a very new design, and improvements have already been made in the year since its launch. I look forward to seeing how this admirable new folder will develop. Owner's report on a 2007 model: In October 2007 we received a report from an owner, Kristian Gustafson, which you can read here.